Chaos + Optima Turbo = ? For those who see my FB, you already know of my fondness of this particular Kia model. Joe hates it with a passion, and a few of you others dismiss it simply because of the badge by it's grille. 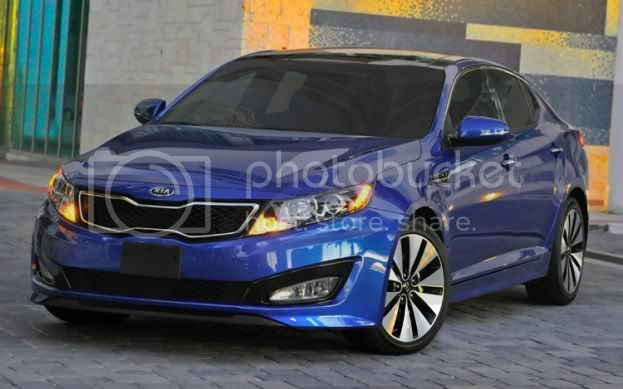 I've been on Kia's site pricing out Optimas, and they're around the price I want to spend. I'm used to not having a whole lot of fancy options, so if I get a bare bones SX Turbo, they're priced at $26,690. That's almost $10K less than the Buick Regals I've been looking at, and these have more aftermarket support, and AWD. Now, My issue is credit. I've been keeping up with the GA's payments again, but I'm waiting until I can qualify for a credit card again to boost my credit score. Basically, spend $50 or $60 and pay it off in a week or two. Never rack up to it's limit and pay early. And of course, I still owe $3K on the GA. Gay. Haters gonna hate, but GM may not be seeing my money if the Regal stays too pricey and doesn't offer AWD. And to be quite honest, I could care less the Optima IS a Kia. It has what I want, priced right, and is goddamned good looking. Kia now =/= Kia a few years ago. I've seen a white Optima (This gen) modified and it looks like a Mercedes/Audi product. Gorgeous. i am starting to like Kias more and more as they come out with newer models. I say go for it. Looks like an Accord & IS350 had a baby. So it's basically a poor man's fwd EvoX, I can dig that, ex for no man trans option.....kinda kills it for me.